Mandarin ducks (Aix galericulata) are perching creatures that are originally from eastern Asia, specifically Japan, China and Korea. These family Anatidae ducks also have a prominent United Kingdom presence -- a result of the accidental fleeing of specimens that were brought up in captive environments. Mandarin ducks are often referred to simply as "mandarins." Although the females of the species possess rather lackluster coloration, the males are rather memorable in this department. Not only do male mandarin ducks boast crimson beaks, their plumage is a blend of purple, red and orange. The female plumage, on the other hand, is predominantly brownish-gray. Female mandarin ducks also have grayish bills. Mandarin ducks usually grow to between 8.3 and 9.7 inches in length. The females tend to outweigh the males, as they usually weigh around 2.4 pounds -- a full pound over the male average. These ducks typically reach reproductive maturity once they're around a year old. 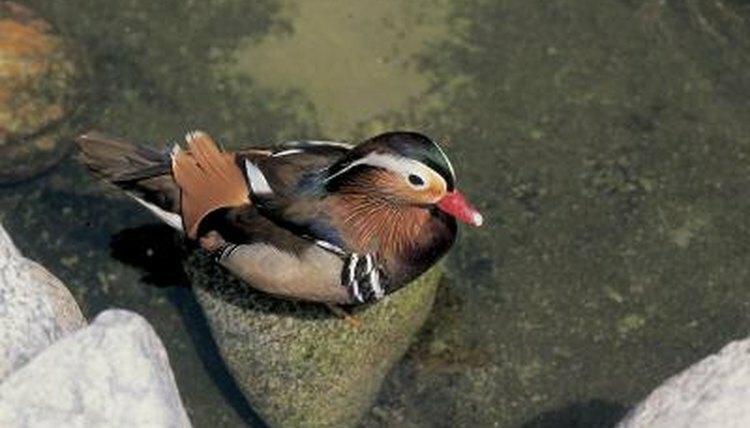 Mandarin ducks generally inhabit marshes, rugged creeks and lakes, particularly those that are in the midst of forest and mountain settings. As far as meals go, mandarin ducks feed on a lot of grains. They also consume a lot of aquatic vegetation. Their diet often depends on the time of the year. Some major food staples for the species are rice, buckwheat, pines, grapes, seeds and roses. Water lily seeds are common foods for them. They also occasionally dine on meaty things, mostly during the spring months -- think wee fish, land snails and bugs. Horsetail shoots are another big favorite for mandarin ducks. Mealtimes for mandarin ducks generally occur either around daybreak or twilight. They generally scour for food either by walking over terra firma or by exploring the top of the water using their beaks. Mandarin ducks also occasionally submerge their heads in H20 while on the quest for food. When they're not looking for food in the middle of the day, they generally can be found resting up in trees, or perhaps even on the land. Mandarin ducks can be found in zoos all over the planet. Their captive diets are often centered around pellet formulas that cater to the dietary needs of waterfowl. They also eat vegetables such as romaine lettuce, bean sprouts and carrots. In zoos, they frequently feed on insects, like crickets, as well.